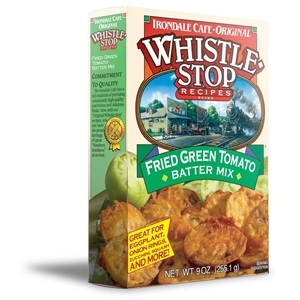 Whistle Stop Recipes Fried Green Tomato Batter is a delicate blend that coats well, enhances, yet allows the flavor of the vegetable being cooked to come through. Great for Fried Green Tomatoes, zucchini, eggplant, squash, dill pickles, okra and more. Over the years we have had thousands of compliments on this fabulous batter and folks are always calling or emailing us with new ways to use. You'll love the good taste of this batter but negociating the check out is difficult.